The oil price is struggling to stay above $30/barrel, little more than a quarter of the price 18 months ago. Recent forecasts for the UK industry have become much gloomier as a result. As recently as three months ago, industry association Oil & Gas UK predicted 79 platforms would close by 2024. Several major consultancies have since suggested that it might be more like twice that. So how pessimistic is it reasonable to be? First the big picture. Since the first significant oil and gas production in the UK in the 1960s, 28bn barrels of crude oil and more than 2.4tn cubic metres of gas have been extracted, mostly from the North Sea. According to the latest estimates, a further 3bn barrels of oil and 0.2 trillion cubic metres of natural gas are proven to be recoverable – plus about the same again in probable reserves. That may be a fraction of what has gone, but it still amounts to revenues of around £200bn. The viability of the sector fundamentally depends on the oil price. There are large discrepancies between what economists think will happen to the price next, but most agree it is unlikely to return to its pre-crisis level of around $110/barrel in the medium term. The immediate reaction of UK’s oil and gas producers has been to continue production at the same pace. In the third quarter of 2015, total oil production increased by 7% year-on-year and drilling activity remained stable. That’s not to say there has been no reaction – 65,000 out of 440,000 jobs had gone by last September and capital investment is thought to be falling substantially. Without question, the business climate has fundamentally changed. 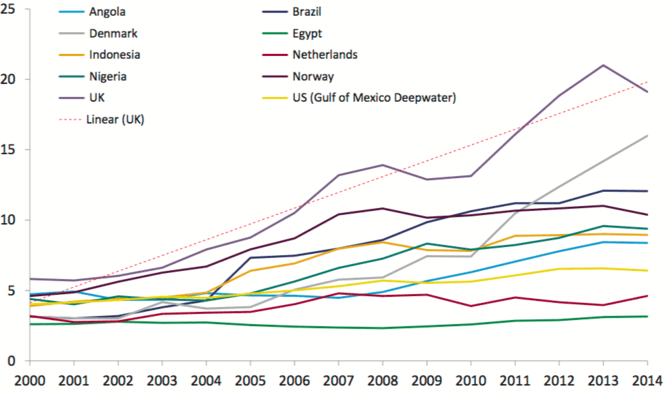 The high operating costs in the North Sea are a central concern. Even under more favourable prices, the industry would have a competitiveness problem relative to other regions. It costs around £17 to extract a barrel of oil, among the highest in the world. One telling statistic for the UK industry is that while its oil extraction cost was similar to that of Norway as recently as the mid-2000s, they have now sharply diverged (see chart below). One study has argued that this is primarily because the Norwegian state bears a higher fraction of the exploration costs and thus takes some of the risks from producers. The UK industry is currently trying to cut its unit cost to £15 by the end of this year, and has brought it down from a high of £20 in 2013, but even that may not be sufficient to sustain the industry in its current form. Compared to Oil & Gas UK’s November forecast of 79 platforms closing by 2024, consultancy Douglas-Westwood now predicts 146 platforms will go between 2019 and 2026, accounting for more than half of the removals between 2016 and 2040 (the total number of platforms is currently around 300). It says that ageing UK platforms “are uneconomic at current commodity prices, as a result of high maintenance costs and the expensive production techniques required for mature fields”. 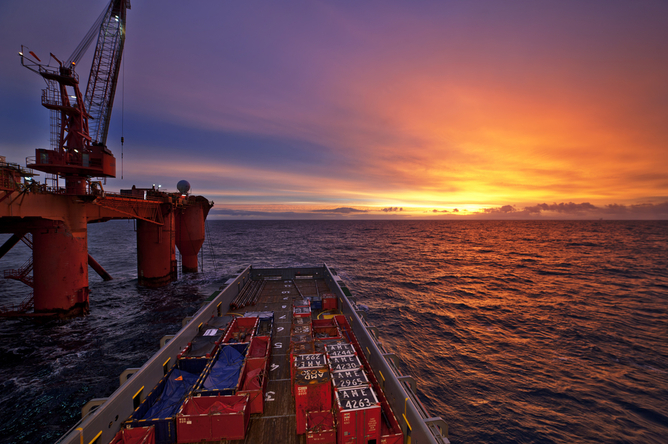 Meanwhile Wood Mackenzie, another consultancy, believes that 140 offshore UK fields will halt production in the next five years – even allowing the oil price to rebound to $85. One consolation, according to Douglas-Westwood, is that larger platforms are likely to keep pumping in spite of low oil prices until the 2030s. This is because they have an additional role as stations through which smaller, newer platforms route their petroleum back to shore. Either way, the situation is looking critical. It is not easy to say how negative it is right to be – the discrepancy in the different oil-price forecasts is a good indication of how hard it is to foresee the future of the industry. However, with the consensus that prices are not going to rise much for some time, the fact that these forecasts for UK activity are getting worse is probably the correct direction of travel. With around 375,000 jobs directly or indirectly affected by the North Sea oil and gas industry, the health of the UK continental shelf is of the utmost importance to the economy. This is putting increasing pressure on the Westminster government to reduce the tax burden and support investments to make the business proposition more attractive. It started to react last year by reducing the supplementary charge levied on oil producers from 30% to 20% and cutting the petroleum revenue tax from 50% to 35%. Time will tell if the UK government will do more at next month’s Budget. We would only note that it hasn’t done as much as Norway to help shoulder the burden of production costs. Last month the UK government announced a £250m investment into Aberdeen to secure oil and gas jobs and help the economy to diversify – doubled by a parallel infrastructure investment from the Scottish government. The emphasis on diversification reflects the fact that the authorities are increasingly acknowledging that oil and gas will not be the same driver in future, irrespective of the governments' efforts. All the same, there is still an opportunity to soften the blow if the governments and the industry do what they can. Together with technological advances that have gradually made it possible to extract more oil more efficiently, the UK North Sea may still have some life in it yet.